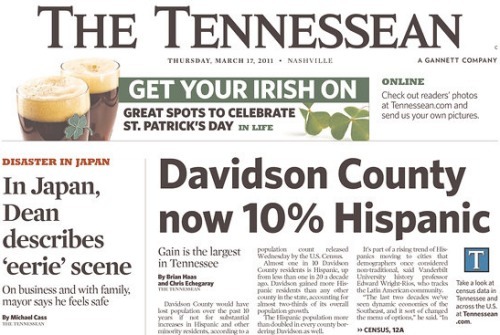 The Tennessean reported yesterday and today on the numbers from the 2010 U.S. Census that show that Nashville/Davidson County is 10% Hispanic. On the front page of the print edition, this above-the-fold declaration about the growth in the Hispanic population is accompanied by news about the mayor's outreach to Japan and a teaser for a story about the city's St. Patrick's Day celebrations. This three-way combination is appropriate, because history buffs can open a window into how the Japanese were viewed by Americans seven decades ago, and how the Irish were viewed by Americans a century and a half ago, by reading some of the comments to yesterday's Tennessean story. But let's not dwell on the rabble-rousers. Today is March 17, a day for celebration, St. Patrick's Day! We Irish, Japanese, Hispanics, and others are all in the same boat, and I'll raise a glass to that. FYI, mark your calendars for the March 26 Cherry Blossom Japan Relief Event in downtown Nashville. More information at the Japan-America Society of Tennessee.